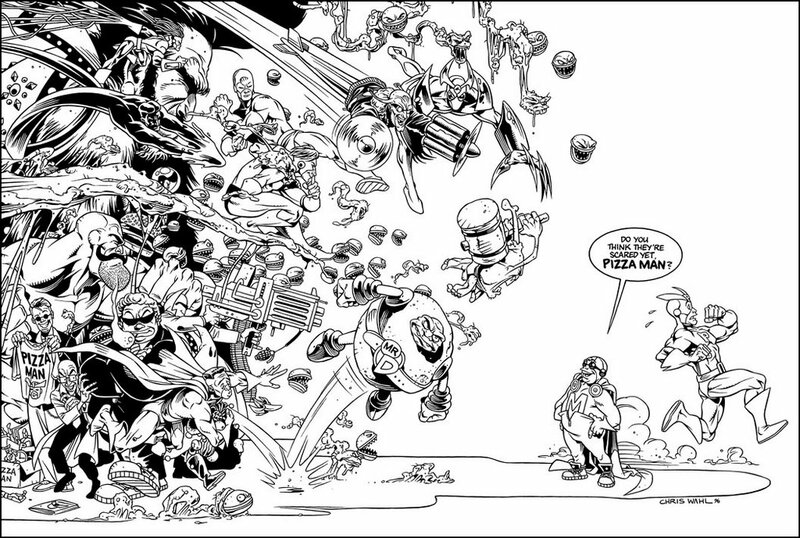 An unpublished wraparound cover for Aussie comic character Pizzaman created by Damien Shanahan, done over (yikes) ten years ago. The design was Influenced by the 'Official Guide to the Marvel Universe' wraparound covers by John Byrne (a big early influence of mine) from the 80's. I used to love Pizza Man, and to a lesser extent Mozzarella Boy! Wow! It has been quite a while since I thought of Damien Shanahanahanahanahanahanahan too! Damien Shanahan and his brother Aaron these days are living the rock'n'roll dream, with their band, Puppetmaster. And they're getting quite a bit of airplay and touring quite extensively too. pizza man rules i have a few pizza man comics.